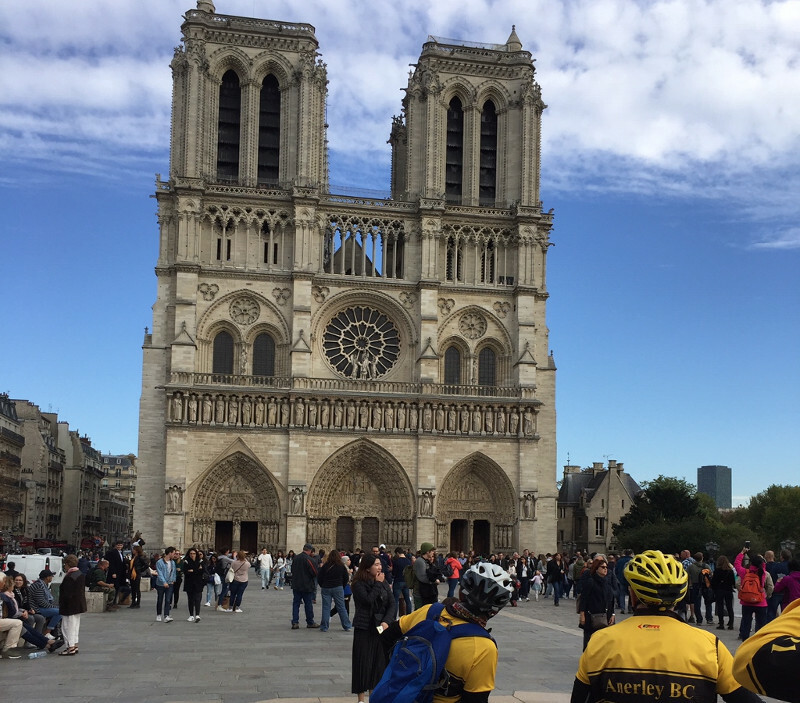 Rivers, Chateaux, Rolling Hills and Giant Hedgehogs – Paris Ooh la la! 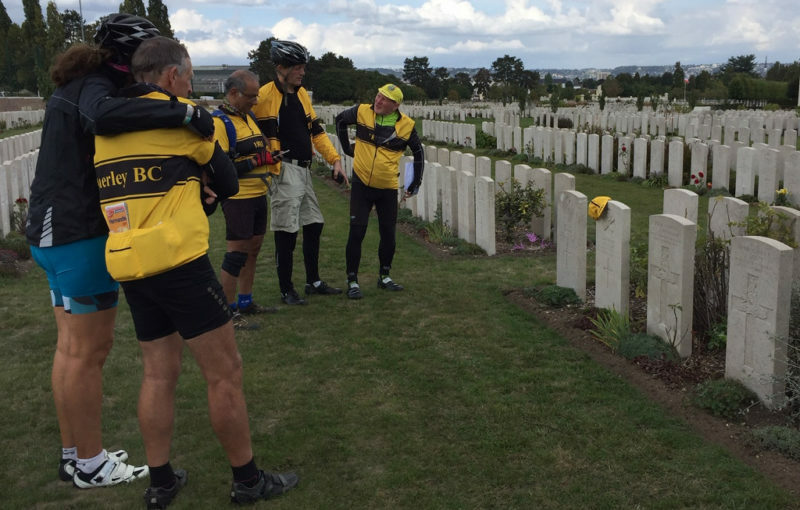 Four set off from Sureguard at 1pm last Thursday, destination Newhaven (48 miles via Tulleys Farm and Lewes), closely followed by 2 more when we all rendezvoused in an Italian restaurant on the waterfront prior to taking the overnight ferry to Dieppe. Ably led by Stuart and assisted by Tom V, the followers were Tom Tom, John Eden, Claire and Denise. 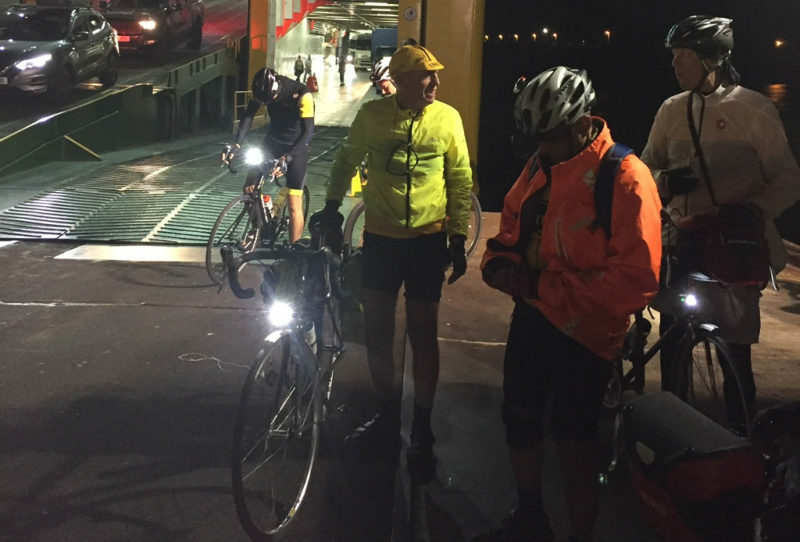 After a short but very comfy sleep in our bunks we started our first ride at 5am (4am UK time) on the pitch dark chilly shores of Dieppe, destination Rouen. 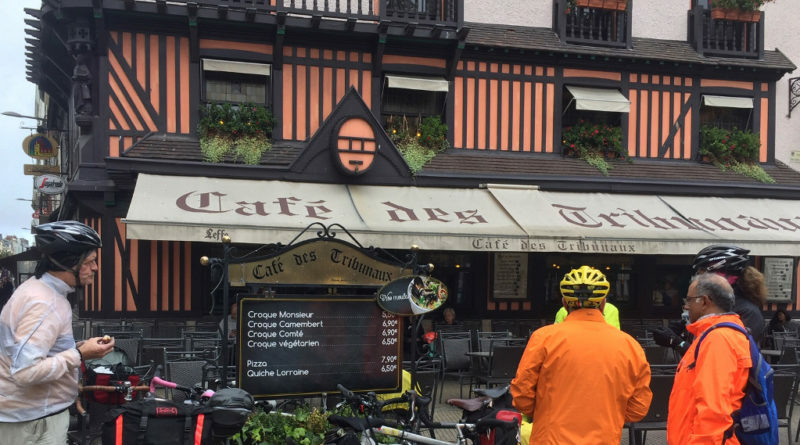 I clocked 53.4 uneventful miles which found us arriving in Rouen on the banks of the Seine with plenty of time for a leisurely lunch (French crepes, bottle of red etc) and a sightseeing look round the city and Rouen Cathedral. 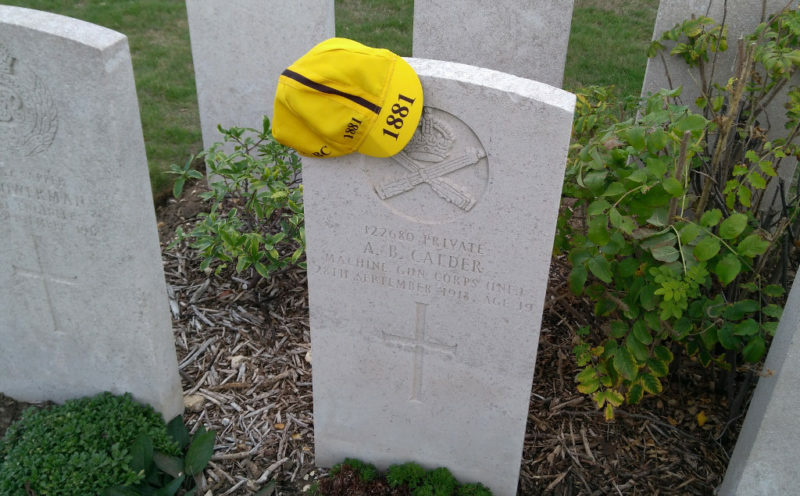 We then headed to the military cemetery to pay our respects at the grave of private A B Calder, an Anerley member who lost his life 100 years ago on 28 September 1918 (gas poisoning). 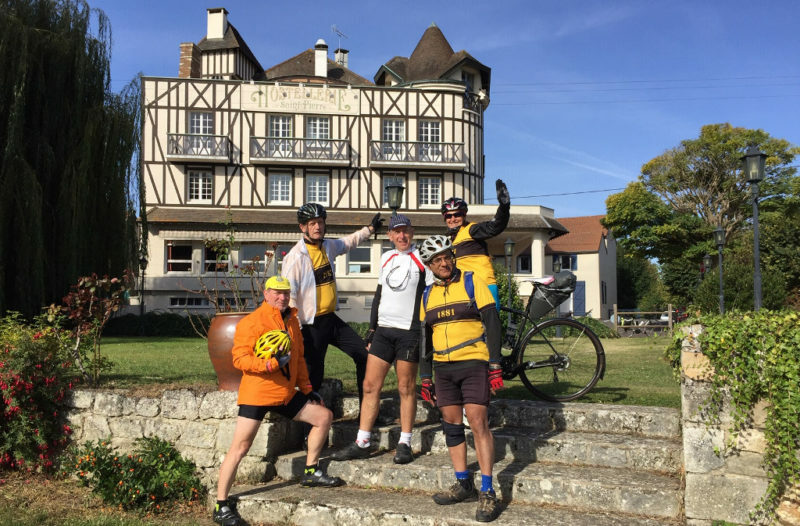 A short ride late afternoon took us to the hotel south of the city in a place which looked alarmingly like the Purley Way minus Ikea, where we found a very decent French buffet style restaurant and a bit more vin rouge. An early start on Saturday and we were back on the road, destination Epone, where we stayed for 2 nights in the Campanile hotel. 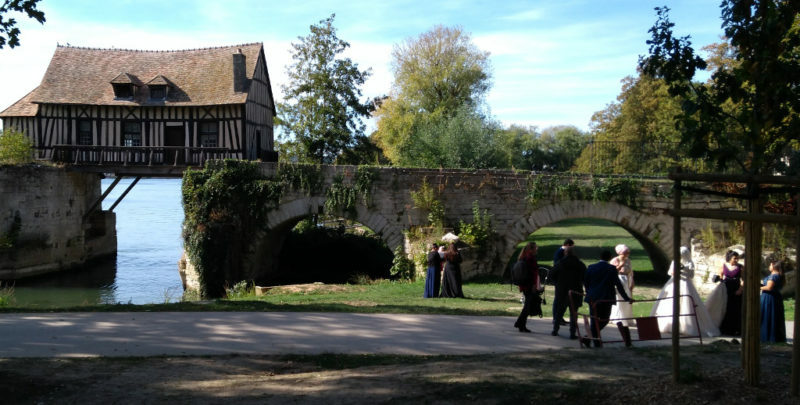 We had a beautiful sunny warm day for our ride which followed the river Seine on mostly flat terrain past pretty chateaux and villages including Giverny, famous for Claude Monet’s home & garden. 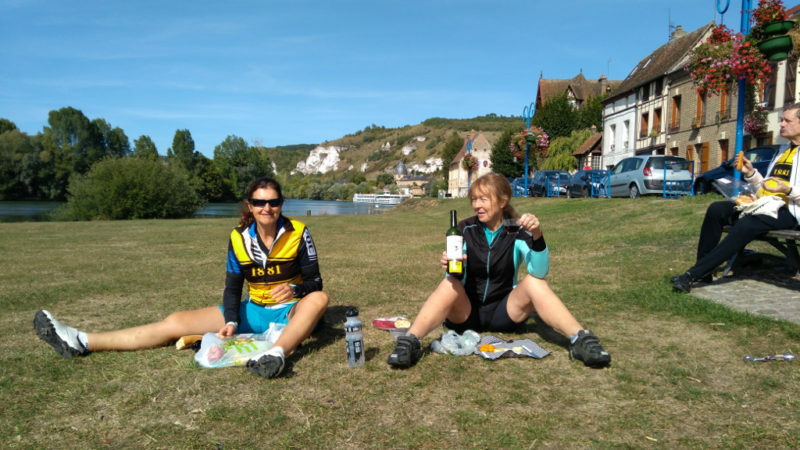 We clocked us another 81.3 miles and had several stops to admire the scenery, have coffee then enjoy a fabulous picnic lunch a la Francais on the banks of the Seine. Claire was our volunteer (fluent) French speaker for the trip and by now was starting to get a reputation for sloping off to have a chat with any French person who would listen to her story of the Anerley on tour. There proved to be many of these lengthy conversations with the rest of us grinning and nodding in the back ground oblivious to what was being said! On our arrival in Epone Stuart soon found his beloved Lidl supermarket and we decided to do a quick shop for a DIY supper held in Stuart & John’s room . 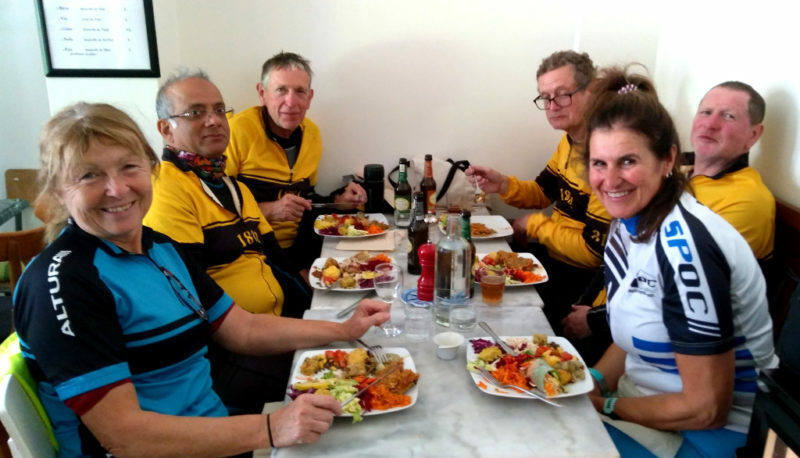 On the menu – bread, crisps, nuts, cheese, couscous, After Eight chocolate and vin rouge with a few beers thrown in. Who said cyclists know how to eat healthily !! We redeemed ourselves a little next morning with plenty of fresh fruit & yoghurt on offer at breakfast. 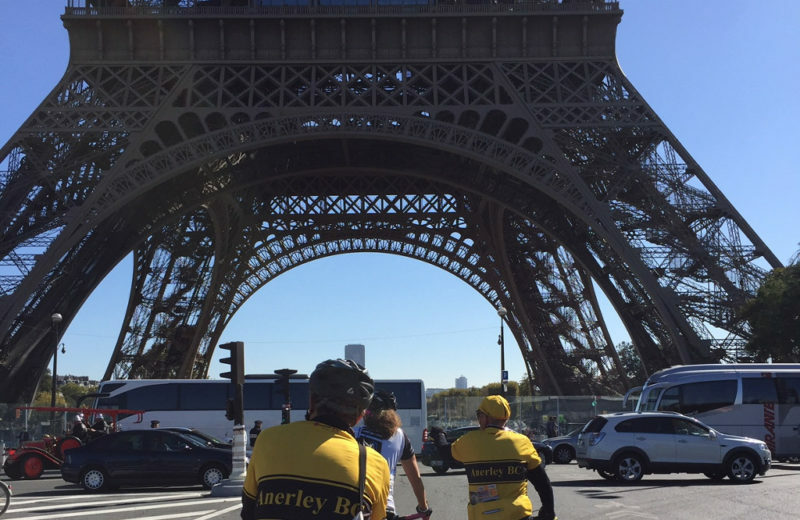 When we set off for Paris via Versailles and clocked up another 48 miles. 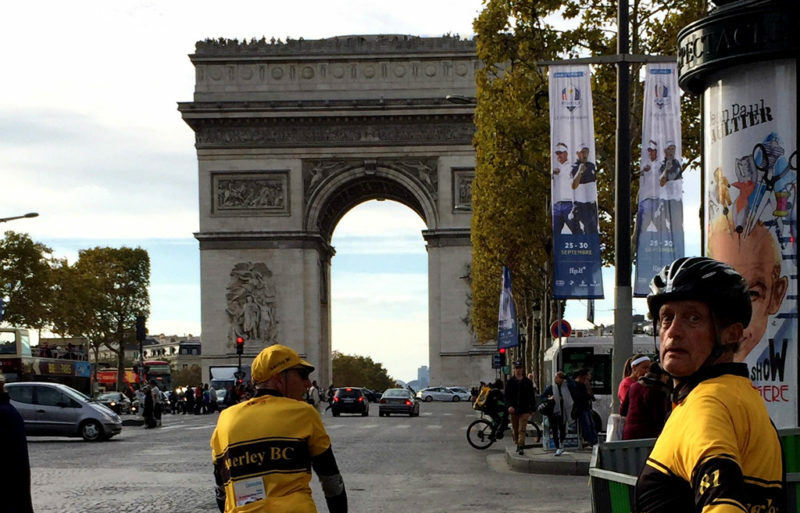 This was a challenge highlighted by a hair raising ride up the Champs de Elysee to the Arc de Triomphe where Capt Tom performed a dutiful lap which was videoed. Tom then sent the video to his wife Nina and has since lived to regret it. 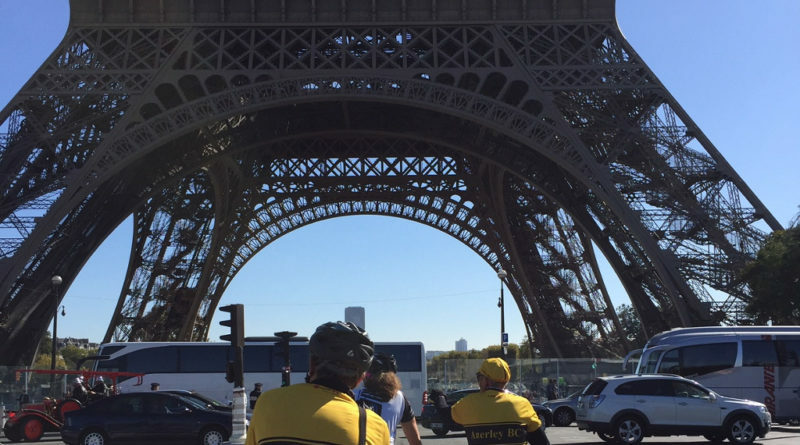 Other highlights of our peddling through Paris was seeing the Eifel Tower, Notre Dame, Centre Pompidou and the Louvre. We had a fabulous vegan lunch (to make amends for the previous food choices!) at café Ginger near the Bastille which was delicious. To max out the time available for sightseeing we decided to take the train back to Epone – a 45 minute journey closely followed by an early night. 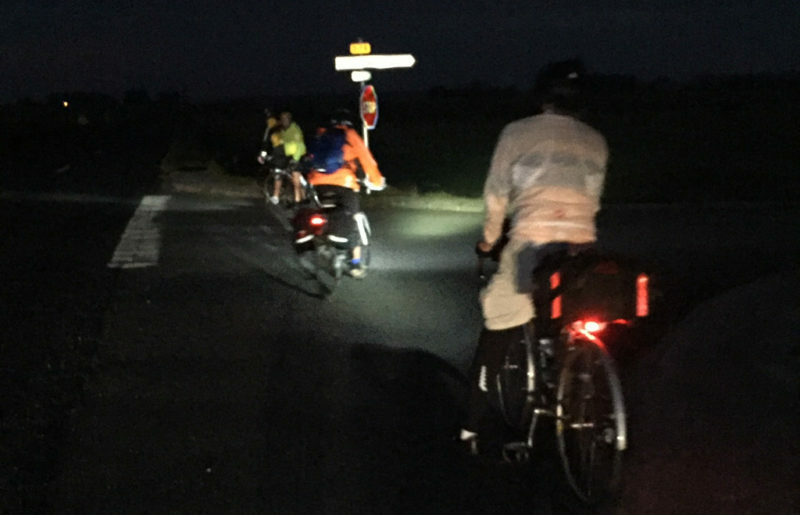 Another early start and we were back on the road, destination Forges des Eaux and the Sofhotel (a la Fawlty Towers). For some (me) this proved the toughest ride as we battled 69 miles into rather blustery headwinds. My day was saved by Tom V who suggested I tuck in behind him as (by his own description) “everyone needs a wardrobe to follow” Thanks Tom! 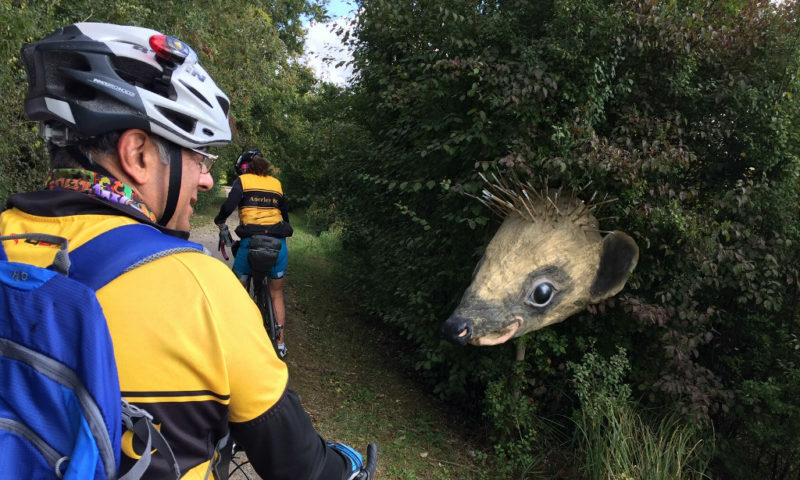 Other parts of the route were less blustery and took us along parts of the Avenue Vertes where we encountered several giant hedgehogs along the way before arriving at Fawlty Towers. 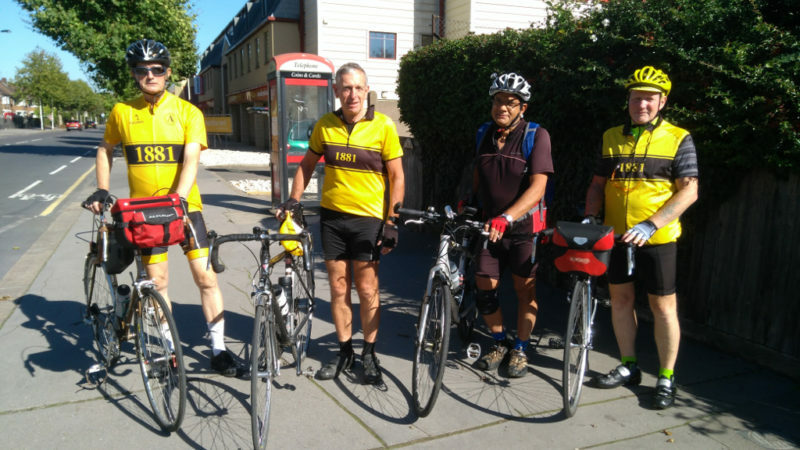 We were quite worried when we pulled up outside the Sothotel but soon came to realise that it was actually quite charming and very bike friendly – the garage was open ready & waiting for our bikes which were duly locked up and secure for the night. 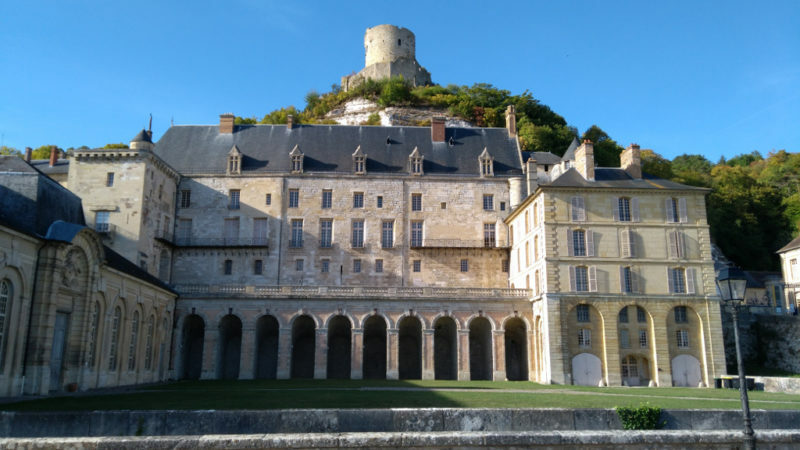 The staff were lovely – plenty of obliging Manuels, Basil was on holiday, and we had a super evening meal fuelled by too much cheap vin Rouge and subsequently plenty of banter, a lot of which involved lengthy discussion on how could the girls possibly manage with such small bags ? Note to the men – only take what you actually need fella’s, nothing more, nothing less but don’t forget the lipstick! 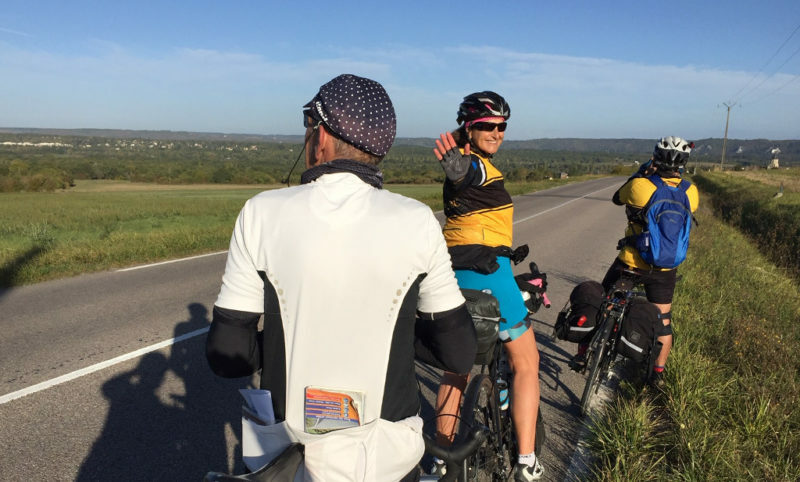 The final ride of this super trip was a leisurely 35.8 miles back to Deippe along the Avenue Vertes, very easy and flat but we got a little bit of rain along the way. 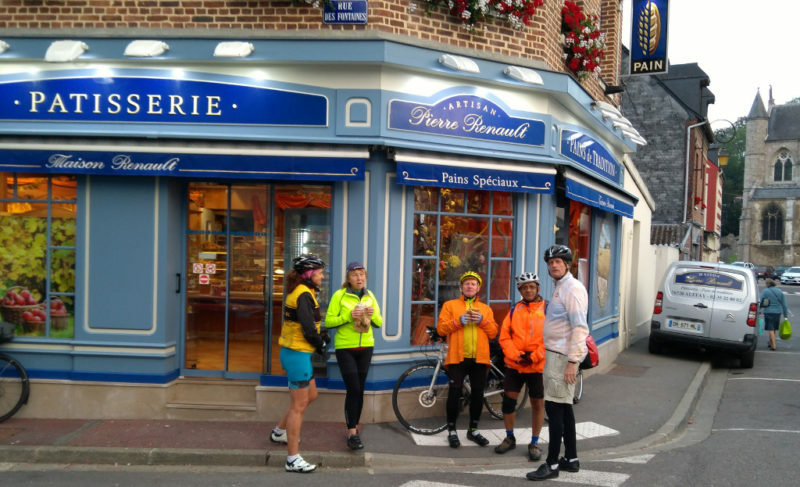 We reached Dieppe in plenty of time for a Croque Monsieur in a bar favoured by Stuart & Tom Tom before heading back to the ferry for a boring 4 hour crossing home. Maybe that’s why the men managed to consume another 2 bottles of red, a few beers and another picnic selection of breads and cheeses a la Francais. Some had a sprint for the 9.30pm train from Newhaven and the others took a more leisurely drive home reaching Purley at 11pm.